Advent Calendar Door 1: Top-down metadata inheritance for SharePoint items and files. Very often there is a situation where you need to enrich the large number of files of list items with the same metadata set, usually for the search purposes. 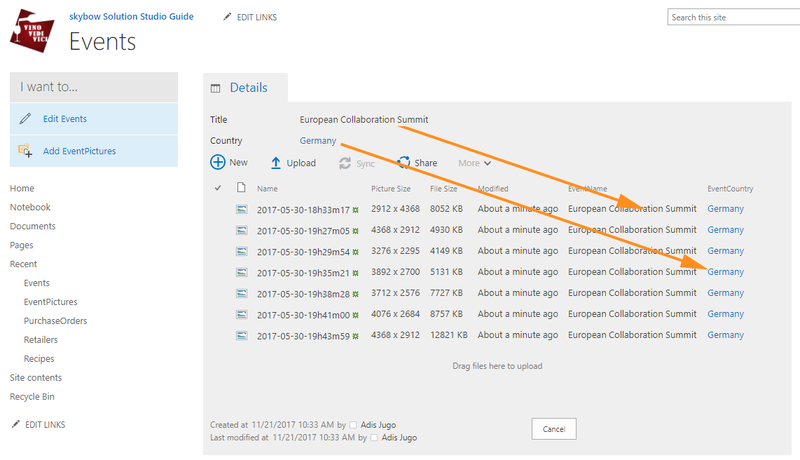 Imagine this situation: you are uploading photos from an SharePoint event into SharePoint picture library, but those photos have no metadata (metadata which we would like to have is usually located in a list item where the event data is stored), and they are difficult to find later through SharePoint search. Luckily, there is skybow to the rescue! 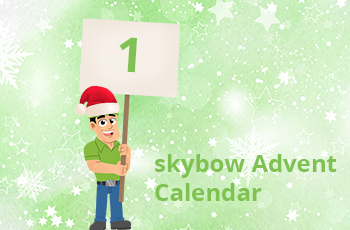 In the first skybow Advent Calendar cookie, I will show you how to use the Metadata Inheritance feature from skybow Solution Studio to implement this within seconds. The target library or list (that one to which we want to inherit metadata to) either needs to have a lookup field to the “master list” (that list we copy the metadata from), or to be declared as a sublist of a dossier in the solution studio. The target library / list of course has to have the fields of the same type (they don’t have to have the same name), where the metadata will be coped to. 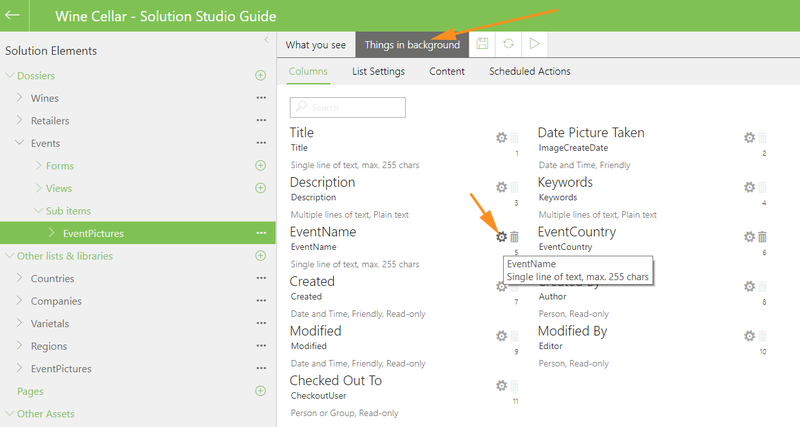 The first step is to open the “target” library or list in the solution elements tree, select the “Things in background” option, and then click on the settings icon besides the field you want to inherit the metadata to. 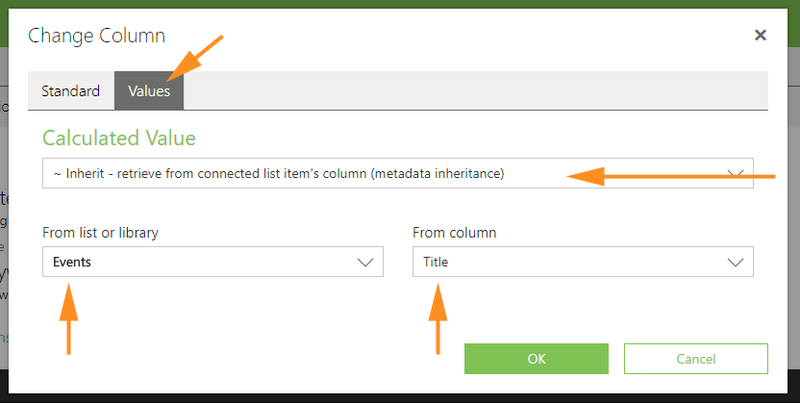 The next step is to click on the “Values” option, choose the “Inherit” Calculation type, and then select the “master” list (list we want to inherit the values from) and chose the field from the master list we want to inherit the value from. Repeat this step for all fields you want to inherit the values to. It will take few seconds for values to be initially copied, since this is an asynchronous background process. If you look at your library or list, you will see that the metadata fields have been properly set. Both lists will be in sync from now on, so each time you change something in the master list, these changes will reflect in the target list.